The Report Card series was devised and developed by P&LA for the UNICEF Innocenti Research Centre (IRC) in Florence, Italy. In consultation with leading experts brought together by the IRC, Peter Adamson authored the first eleven issues of this annual publication (from 2000 to 2013). The aim of the series is to monitor and compare progress and ‘best practice’ for children in the world’s advanced industrial economies. Each report features a league table ranking individual OECD nations according to the progress being made. 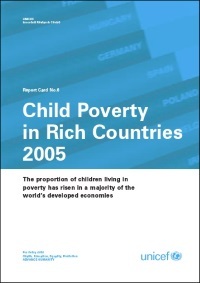 Published in English, French, German, Spanish, Italian, Japanese and Korean, and distributed to governments and major media in all OECD countries, the Report Cards have focused primarily on child poverty, gradually broadening the scope to include international comparisons of wider aspects of child well-being. All Report Cards in the series can be downloaded from the links below or from the UNICEF Office of Research-Innocenti.